proclaiming the good news of the kingdom of God. I was really interested to see that BBC television was offering a program entitled Jesus' Female Disciples: The New Evidence. Helen Bond and Joan Taylor are respected professors in the academic community around New Testament studies, Bond at Edinburgh and Taylor at King’s College, London. I was chagrined that we can't watch it here in Canada, even though it's streamed in the UK. Reading reviews I realized that there might not be much that is new here, at least not for those of us who have been aware that women were a part of Jesus' inner circle. Luke's gospel tells us of the significant support of women, and John has Mary Magdalene as the first witness of the resurrection. 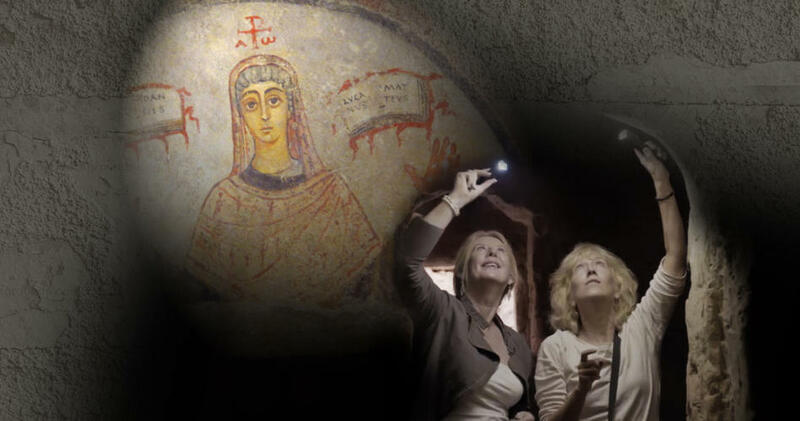 Apparently the program also draws attention to catacombs in Naples where a series of wall paintings uncovered in 2009 depict a woman holding the gospels in flame. This could only indicate she was a bishop, one expert insists. We do know that the apostle Paul, often cast as a misogynist, was actually quite welcoming of women in leadership in various congregations of the early church. Lydia and Junia come to mind. In the end this special seems like rather slim pickin's, despite the efforts to offer the "big reveal." Does it matter? I figure that women were important in Jesus' ministry. I think that Roman Catholicism's exclusion of women in the priesthood because all the disciples were men is patriarchal hogwash. Just the same, I would have been excited if there was something a little more conclusive in the scholarship.